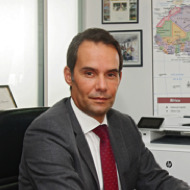 Mr. Karim LOTFI SENHADJI is the CEO of OCP Africa, a OCP subsidiary with 10 offices in Africa and over 150 employees. Prior to holding this position, Mr. LOTFI SENHADJI spent more than 7 years at OCP in different leadership positions, including as OCP’s Shipping and Logistics Vice President and as the Director of OCP Group Management Control Department. Before joining OCP, Mr. LOTFI SENHADJI held different managing positions at several Moroccan and multinational companies, including Holcim Group, Altadis Maroc and Méditelecom.